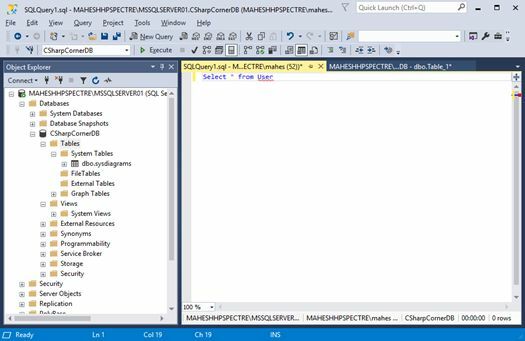 SQL Server Management Studio (SSMS) is a Windows software that allows database developers and database administrators to configure and manage SQL Server and Azure SQL databases. Learn how to download and install SSMS. SQL Server Management Studio is a Windows software/tool developed by Microsoft to work with SQL Server and Azure SQL databases. SQL Server Management Studio (SSMS) allows DBAs and database developers to create and manage databases and their objects. The common functionality of SSMS is to create databases and database tables, execute SQL queries to insert, update, and delete data, create and manage stored procedures, triggers, views, and cursors. SSMS also allows you to set securities on databases and its objects. SSMS is used to configure, monitor, and administer instances of SQL Server and databases. SSMS also provides tools to deploy, monitor health of databases, and reports. You can use SQL Profiler to review performance of your SQL databases. You can also schedule jobs to run the background. 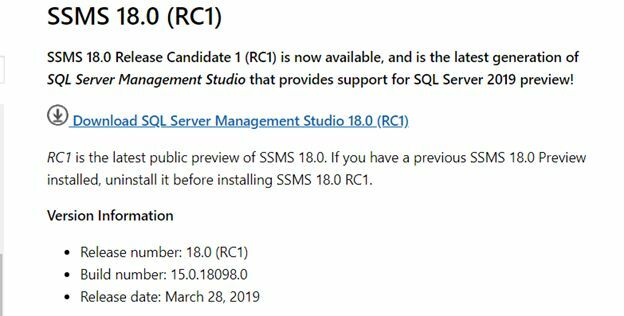 The current version of SQL Server Management Studio is version 18.0 RC. SSMS 18.0 is not supported on Windows 8 and Windows Server 2012; Windows 10 / Windows Server 2016 will require at least version 1607 (10.0.14393). The SSMS 18.x installation does not upgrade or replace SSMS 17 or earlier versions. SSMS 18.x installs side by side with previous versions so both versions are available for use. Learn more here How to Install SSMS 17. Go to Google and search SQL Server Management Studio on the search box. Click on the first link or the link from Microsoft’s website, “Download SQL Server Management Studio (SSMS)”. Candidate 1 (RC1) is now available. 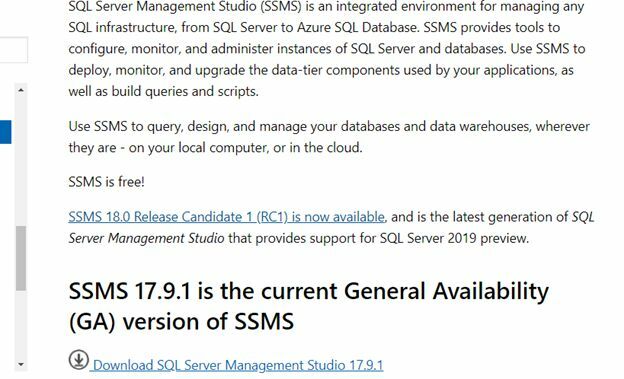 This will take you to the SSMS 18.0 (RC1) download page. Click on the Download link. The download will start. Once downloaded, the installation will start automatically. Follow the installation instructions. Watch the following video to follow step by step download instructions. Here is a list of major new features and updates in this release. SSMS now supports enabling XMLA endpoint connectivity to PowerBI datasets. SMO added cascade delete support to Edge Constraints. SMO added support for data classification read-write permissions. The current SSMS download size is smaller, i.e., less than half of what SSMS 17.x is (~400 MB). SSMS is based on the new VS 2017 Isolated Shell that unlocks all the accessibility fixes that went in both SSMS and Visual Studio. SSMS accessibility improvements in all the tools, SSMS, DTA, and Profiler. SSMS does not share components with SQL Engine anymore. Much effort went in to avoid sharing components with SQL Engine, which often resulted in serviceability issues (one clobbering the files installed by the other. SSMS is not added to the PATH environment variable. Path to SSMS.EXE (and Tools in general) is not added to the path anymore. The users can either add it themselves or, if on a modern Windows, rely on the Start menu. Added support for recently added vCore SKUs (General Purpose and Business Critical): Gen4_24 and all the Gen5. Added support in SSMS UI for UTF-8 on collation dialog. Improved support for multi-monitor systems by making sure that more and more dialogs and windows pop up on the expected monitor.